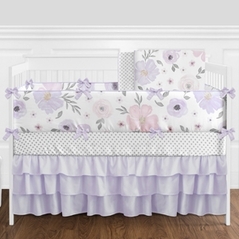 If you love the color purple, why not look into Purple Crib Bedding sets for your baby's room? Purple is the color of royalty, perfect for your little princess. 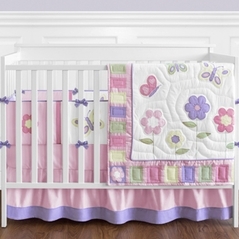 It's a fun color, too, and purple crib bedding will make the room a fun place to be and to smile about. See for yourself! There are many tones of purple to choose from, how about green and purple crib bedding, take a look at the Baby Butterfly crib bedding section. Choose from other top picks such as, Danielle's Daisies bedding, Purple Dragonfly Dreams bedding, Sweet Kayla's bedding, Lavender Dragonfly baby bedding, and more. Be sure to check out the many matching accessories to go with your purple crib bedding set. If you want to smile each time you enter your baby's nursery room, check out our simply beautiful selection of purple baby bedding.